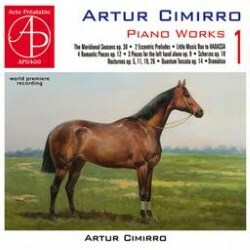 I first came across Artur Cimirro via a rather spectacular recording he made of solo piano music on the Australian Stuart & Sons label, playing one of their 102-key, 4-pedal pianos. I have since become aware of recordings he has made for the Acte Préalable label, concentrating on piano music of nearly forgotten 19th Century Polish and Hungarian composers, such as Karl Tausig, Tivadar Szántó and Alexander Michalowsky. I purchased his Tausig recording mainly because of my interest in Franz Liszt and his circle, and I considered the music to be interesting and could easily believe that it was immensely difficult to play. Like this disc under review, it was recorded at the Opus Dissonus Studios with the pianist himself as recording engineer. Alas, I found it difficult to like the sound of the Tausig CD, no matter what I thought of the music. It was recorded so closely that I could almost believe that the microphone had been placed inside the piano, and somehow the natural reverberation at the bass end of the spectrum had been reduced, and some of the natural bloom of the sound lost. In over forty years of listening I have never heard a piano recording quite like it, and unfortunately it spoiled some of my enjoyment of the music and the performance. Consequently, I was curious to hear whether this CD sounded different and I am pleased to say that it does; again, the piano is very well forward in the recorded acoustic and there is a strong bass presence – some might consider it a continuing overemphasis due to excessive use of the sustaining pedal – but I have always liked the sound of the lower spectrum of a well recorded piano, and unlike the Tausig CD, the bass does not sound incredibly over-damped, so little complaint there. Now to the music: the disc begins with ‘Four Romantic Pieces op.12’, and in the informative booklet, Cimirro tells us that they were composed between 2001 and 2010, with one of them written at the request of his wife who had been listening to some of Mendelssohn’s ‘Songs without words’ and asked for a piece in a similar mood. They are very enjoyable, truly romantic music without sounding (to me at any rate) at all like Mendelssohn. I am glad to say that Cimirro does not indulge in the sort of sub-minimalist pap that Ludovico Einaudi churns out ad infinitum for the apparent delectation of some Classic FM listeners. In fact, if I had to assign a style, I would bring the more modern Rachmaninov to mind and the fourth piece, an impromptu, is blessed with a good tune! His Nocturne op.5 follows, and Cimirro says that it was composed for a friend who wanted an easy piece to perform. It sounds rather Satie-esque perhaps moving towards Debussy although the central climax is dominated by a pounding bass which once again brings Russian music to mind. A friend of mine who has a particular interest in works for the left hand came across Artur Cimirro via his pieces for the left hand alone, and so I was not surprised to find some of them here. As Cimirro says, the first two are studies, fast music challenging the left-hand technique, which he has in spades, whereas the last is a slow romance, once again showing his melodic ability. The Scherzos op10 nos 1 and 2 both use Brazilian rhythms, making their openings sound quite frantic, but both relax dramatically in the middle, returning to busy pianism in their closing sections. The Nocturnes op.11 and op.19 sound very different; Cimirro asked his wife to choose five ‘aleatoric’ notes which he wanted to use as the base for the earlier piece, and he has dedicated it to her. He says that it is very much influenced by the harmonies of Busoni but to my ears it sounds highly romantic, as befits its dedication. The later piece sounds a bit more impressionistic to begin with, but soon becomes surgingly romantic, and for me, very effective. The ‘Quantum Toccata’ op.14 is rather bewilderingly described as being composed of parts that can be connected together in any order, as a quantum jump, in almost half a million variants and then played for any duration (I suppose). Mercifully, it lasts only three minutes. The Nocturne op.26 is, in the pianist’s own words, “very dark, with its chromatic theme and modulations”. He achieves this, unsurprisingly, by using the lower reaches of the piano, but the higher notes add welcome contrasts without disturbing its overall seriousness. His later ‘Dramatic Nocturne’ Op.32b is an adaptation of the Violin Sonatina which, as it happens, works nicely as a piece based loosely on the form of a nocturne. My favourite work on the disc is his ‘Meridional Seasons’, twelve very short pieces, averaging 1 minute each, inspired by short poems which remind the composer of the southern hemisphere seasons. Melodic and forming a nicely contrasted suite – they would stand orchestration, I think. The CD concludes with a 30 second piece based on the name ‘Hadassa’, that of the newly born daughter of a friend, and with ‘Two Eccentric Preludes based on Chemical Formulae’. Well, just as composers have used other peoples’ names (such a BACH) to create the thematic basis of a work, it is possible to do the same with chemical formulae (e.g. HCOOH – Formic Acid), and so Cimirro has created two pieces derived from more complex formulae given to him by friends. This is an interesting idea, but I don’t find the pieces memorable in any way. All-in-all, this is a worthwhile and interesting CD. Rarely does one find a disc on which the music is composed, performed and recorded by the same person. Cimirro clearly has a virtuoso technique as a performer and recording engineer. The sound of the CD is close-up with an unusually vivid, warm and resonant bass. I have found it a most interesting listening experience. The booklet is well produced with detailed descriptions of each piece and the texts of the poems used for the ‘Seasons’. Mr Cimirro has evidently put a lot of effort into this production, and he has also translated the text into good English from his native Brazilian-Portuguese.